The name Elliot originates from the village of Eliot in Forfarshire although the old English form of Elwold also appears in Scotland. The Elliots were one of the notorious Border clans and were found in the district of Upper Liddesdale. The principal family in the early days was the Elliots of Redhaugh, but the branch that later was to represent the senior line was that "of Stobs" The Elliots of Stobs originated in the 16th century from Gawain Elliot of the Redhaugh family. His younger son, Gilbert Elliot was convicted of High Treason in 1685 for his work towards religious liberty, only pardoned after the ascension of William of Orange. He was created baronet in 1700 and conferred a Lord of Session as Lord Minto in 1705. His son and grandson, the 2nd and 3rd Baronets were likewise educated for the bar, sat in parliament and held other high official positions. Jane, sister of the 3rd Baronet was famed for her composition "The Flowers of the Forest" that told the story of the men lost at Flodden. George, 4th Baronet was conferred 1st Earl of Minto, he also followed his father before him into politics and in 1794 was made Viceroy of Napoleon's island Corsica. In 1807 he was appointed Governor General of India, succeeded by his son who became Viceroy of India in 1905 and who was the chief architect of the Morley-Minto Reforms that despite being radical at the time were still insufficient to stem Indian discontent. I am in the middle of research into the lands possessed by the first Ellot/Elliot Border Reiver clan chieftain. 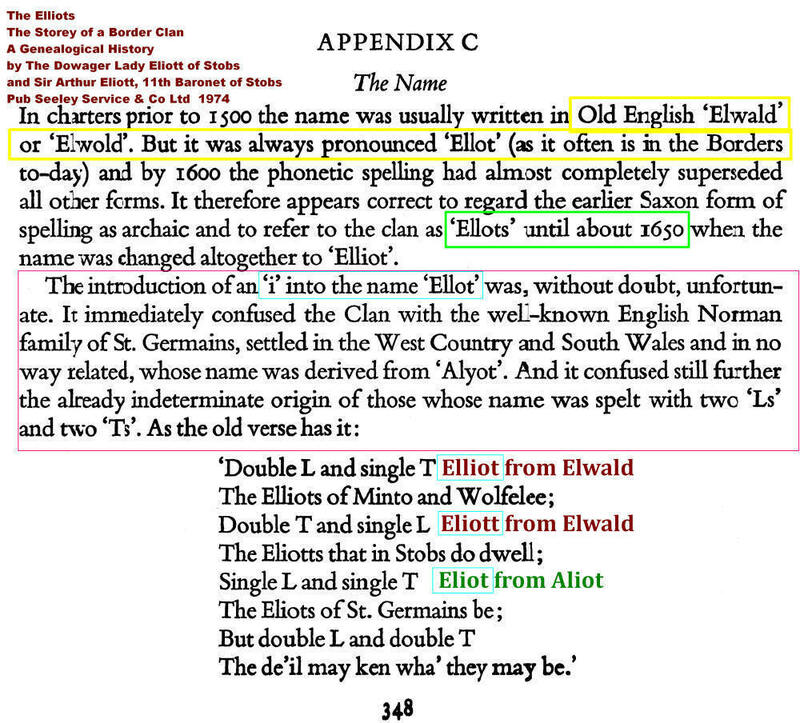 The name Elliot was notorious for its variants, due to problems of medieval phonetic spelling, explained by David Crystal in his encylopedia of the English languate. One problem was the many failed attempts by scriptores, whose maternal language was neither Gaelic nor Middle Scots ( not spoken yet when Alyth was probably founded with the barony, consisting of a thanage probably alienated by William I in the late 12th century to the ancestor of Walter d'Alyth, the first baron. Walter of Alyth was Walter Elliot. Elliet was one of many variants of this Breton name. An early Bruce adherent, he forfeited Alyth to Adam Brunyng in 1306, whose son John later supported Bruce. In recompense Alyth/Ellot/Eloth/Elliot ( non English scribes struggled with the name ) Bruce had the Elliots settled in Liddesdale, as vassals of his natural son Sir Robert. Scott of Satchells referred in the 17th century to Alyth as "the town of Elliot at the foot of Glen Shie." The gaelic "aileadh" is perhaps based on guesswork, and the 1640 name Elieht is very much in line with Scott's claim. Alliot was another variant of Elliot, imported from Brittany among William the Conqueror's Breton contingent. Many settled in the Breton Count of Richmond's honour, and today the names Alliott, Allott and Allitt are still found more commonly in Yorkshire. Dalliot = d'Alliot was another no longer extant variant. Elliots/Alliotts ( plus variants like Elligott and Ellacott) were established in Scotland during the "Davidian Revolution." DNA analyses confirm their Celtic-Brittonic origins. Designed Reid-heugh, which is now called Lariston. As Elliot Clan historian, I thought that this might interest you, and set off a debate among local historians. I have now traced two historic maps showing Eliot in place of Alyth, and The Forest of Elieht instead of Alyth. Whilst the old medieval misspelling has been retained, here were two cartographers who listened to, or heard how, the name was pronounced, and at a time when spelling was becoming more accurate, entered Eliot and Elieht into their hand-drawn maps. Scott of Satchells was also spot on when referring to the town of "Elliot" at the foot of Glen Shee. There is now no doubt that (a) Walter Elliot of the Brae, shown as Walter of Alyth in the 12th and 13th century ( land forfeiture 1306, summons by Edward I to military service, and swearing of fealty to Edward after the battle of Dunbar ) was recompensed for loss of his lands by the grant of other lands in Liddesdale. All information on websites other than that now being revised by our clan society is now blown out of the water. The charter name Elwald, given circa 1320 was spurious, although we shall never know the reason why and can only speculate about an attempt to give these warriors of Anglo-Norman origin, who came to Scotland during the "Davidian Revolution", possibly in the retinue of west country barons who are known to have benefited. For example, the Berkeleys (now Barclays) are purported by Professor G W S Barrow, the highly respected former Emeritus Professor (Edinb. )to have come from Castle Cary in Somerset, where today there are Eliots, who share the same ancestry as the current Earl of St Germans, Peregrine Eliot, who has confirmed that the theory that his family, was never based on more than supposition. His ancestors first settled at Plympton in the post-Conquest lands of Judicael, viscount of the Halegouet, the Elliots ( and Alliots, Eligotts, Ellacotts etc etc) ancestral homelands during the Breton Viking wars. Robert of Bampton, Somerset, was also an ally of David I, in support of his neice the Empress Matilda, during the first English Civil War. The Scottish de Braose branch was a Devon family. The name Elliot in South Wales indicates Breton participation in the conquest of that territory by William fitzOsbern during 1070-71. The most important thing now is to establish the Breton origin of the name and its several variants, and to discount Elwald as an attempted anglicisation ( which undoubtedly it was, for whatever reason) and to stress the migration of Elliot ancestors to England and Wales during the Norman Conquest, and later to Scotland when the Macmalcom dynasty was importing scores of Norman, Breton and Flemish knights and setting up feudal military tenure. There are even silly websites which claim that the name is of Hebrew or Jewish origin!! God help us with rubbish like that on the internet. Incidentally, I have a "first" in History, UCL London 1971. You have already been kind enough to accept previous information from me about the Breton origins of the Elliots, transplanted into Liddesdale from the north by Robert Bruce circa 1320. Your information that Alyth (Perthshire) had been spelt on an early map as Elieht was crucial: an online search of NLS maps, now digitized, revealed other maps which showed Alyth as Elieht, Elyeht, and finally on separate occasions, by the highly reputed cartographers Herman Moll and John Adair - as Eliot. The 17th century antiquarian, Scott of Satchells, had long since claimed that the Elliots came from the town of Elliot, with twelve great families, at the foot of Glen Shee. 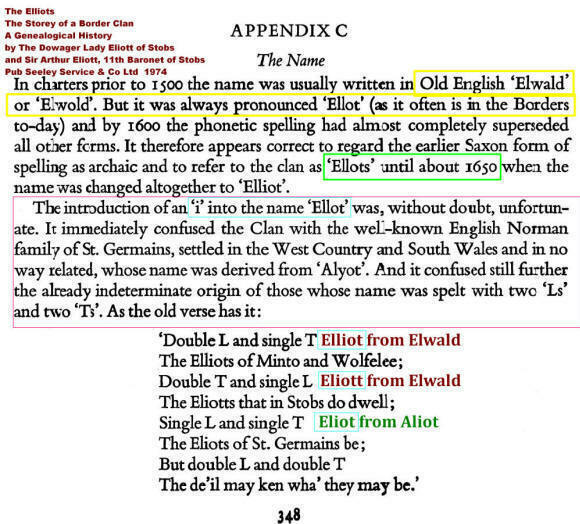 How the name Elliot - often shown as Alliot, or more accurately in medieval times as Dalliot, or more accurately d'Alliot, according to the clerical preferences of the time - was written as Alyth, which with the y clearly representing the semi-vowel of yes led me to consult the work of historians of the English language, like David Crystal, who has a clear answer. The evidence now accumulated, DNA, primary and secondary sources, etc., is overwhelming. Like the Stewarts, the Elliots were of Breton origin, involved like the Stewart progenitor from Dol, Walter fitzAlan, in the "Davidian Revolution". This paper will now be published via a link in the Autumn issue of the Elliot Clan Society Newsletter. The only loose end now remaining is to find what was the Elliot connection with Arbirlot, or Aber-ellot etc. I am beginning to suspect a connection with one of the first two abbots, sponsored by Bishop Jocelin of Glasgow, whose forename was distinctly Breton, and popular with the viscounts of Rohan (Roc'haned) in Brittany who founded the town and castle of Josselin, but proof is another thing.